Arrogance defines US imperialism. In 1945, America’s economic, political and military dominance stood unchallenged. Obama exceeded the worst Bush policies. If reelected, he’ll surpass what he’s already done. So will Romney. Will waging war on humanity be America’s Waterloo? Immanuel Wallerstein also sees US dominance declining. He dates it from the 1970s. Post-9/11, it accelerated. “The economic, political and military factors that contributed to US hegemony are the same (ones) inexorably produc(ing) the coming US decline,” he believes. It’s “too late for mere scattered reforms of our government or bloated military to make much of a difference,” he added. Tyranny and loss of personal freedom follow. It arrived unannounced. It’s wrapped in an American flag. It’ll harden. It’s heading the nation for ruin. Washington is permanently at war against enemies it creates. Doing so is secretive, unaccountable, intrusive, repressive, and self-destructive. Duopoly power and diktat executive authority rule. Checks and balances don’t exist. Homeland social decay deepens. Corruption is endemic. It’s too deep-rooted to reverse. Institutionalized spying and police state laws threaten everyone. Major media mind manipulation substitutes for real news, information and analysis. America chose the wrong path. It’s too late to change. 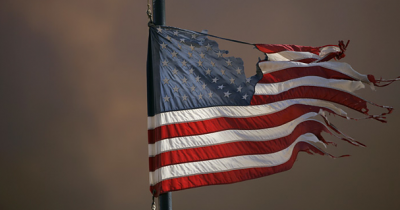 Permanent wars may prove America’s undoing. Will humanity go down with it? Issues cited included public rage and violence in dozens of countries after the US anti-Muslim film aired, attacks on American diplomatic missions, and killing ambassador Chris Stevens in Benghazi. Winning friends and influencing people isn’t accomplished by attacking, killing, colonizing, and exploiting them. Imperial arrogance is blind to what others see. Nor will it stop what it’s addicted to continuing. Bad endings follow. Mindless militarism and belligerence costs trillions of dollars. Vital domestic needs go begging. Occupied Iraq violence persists daily. Afghanistan is America’s longest war. It was lost years ago. No end game looms. Libya was ravaged and destroyed. Out-of-control violence continues. Installed puppet leaders have no control. In early November alone, one or more rocket propelled grenades struck Tripoli’s intelligence headquarters. It was set ablaze and looted. Casualties were reported. Merchandise in shops along Zawiya Street was stolen. Rival militias clashed in the city. It’s a war zone. So are other parts of Libya. Central Tripoli Hospital was attacked. In Benghazi, a car bomb targeted a police station. Injuries were reported. Days earlier, dozens of Libyans stormed the National General Congress. Voting on new cabinet members was postponed. According to Libya’s Warriors Affairs Commission, around 250,000 armed men have their own agenda. Some are government militia forces. Others express open opposition. Weapons are readily available. Armed clashes occur regularly. NATO wants Libya divided into Tripolitania, Fezzan, and Cyrenaica. Washington, Britain, France, and Italy supported this going back decades. Green resistance fighters want Jamahiriya governance restored. Their struggle won’t end until Libya is liberated. Tass said protesters blocked Libya’s major Zawiya oil refinery. Fuel shortages are reported. Wounded anti-Gaddafi fighters want promised compensation paid. Washington’s concerned only about its own interests. Expect widespread rage to continue, not subside. Western-backed conflict ravages Syria. Everything America tried so far failed. Replacing Syrian National Council (SNC) officials with new ones won’t work better than America’s Plan A. Strategy changes show US plans in disarray. Plan B was crafted in Istanbul. At issue was determining if militia leaders could be more effective. Al Qaeda and Salafists control them. Washington uses them strategically. Empowering them might be too much to tolerate. Clinton wants an opposition makeover. She wants Riad Seif heading a new government in exile. It’s called the Syrian National Initiative (SNI). Seif’s a former Syrian parliamentarian/dissident now living outside the country. She hopes he has wide support. Previous efforts to pick leaders fell flat. Don’t expect this time to be different. Seif, in fact, said he won’t lead a government in exile. He’s 66 with health problems. By November 7, SNC/SNI plan to expand their ranks to over 400. They’ll also elect a new 40 member secretariat. It will choose a new leader. Washington and key NATO partners hope doing so will work better than previous efforts. Dialogue with Damascus is ruled out. At her November 2 press briefing, State Department spokeswoman Victoria Nuland was less than forthcoming. She wouldn’t say who was invited to Doha or precisely what’s planned. She said Washington hopes broader, more representative opposition elements will emerge. Little else was explained. Observers know everything tried so far failed. Perhaps few believe Doha will turn out better. Washington’s efforts to build an effective opposition resemble failed US/UK mid-1950s plans to subvert Soviet Russia/Nasser/and Ba’ath Party influence. A second year later scheme proved no more successful. Months later, the United Arab Republic emerged. Things that go around, come around. Syrians have good reason to resent Washington. Another Western defeat may follow. On November 1, Voice of Russia contributor Dmitry Babich called “US Syrian Policy In Tatters.” Regime change plans haven’t worked. Unresolved conflict claims scores of new victims regularly. Russian Foreign Minister Sergei Lavrov expects continued bloodshed. He condemned US efforts for a new Security Council resolution he said assures intensified conflict if passed. Moscow’s opposition will prevent it. He added that Western countries want opposition forces united to continue conflict. They won’t dialogue, he said. They bear full responsibility for daily violence. “We heard (about) direct orders (from America on) what the Syrian opposition should do to form a ‘government in exile,’ and about who should join such a government,” it said. Lavrov and other Russian officials repeatedly say Syrians should choose their own government and run their own affairs. Clinton warned Russia about “consequences” if Moscow doesn’t bend to US demands. Since conflict erupted last year, Putin/Medvedev remained firm. Expect no change of policy now. Angry SNC figures responded to Clinton’s plan. Some say Washington was never sincere. It’s now trying to hijack Turkey’s role. Ankara from the beginning provided support. Tello stressed Washington’s insincerity. It’s concerned only about its own interests. Washington “is aware that there isn’t a united opposition to fight against Assad in Syria. So it aims to create such a group under US control.” He believes new efforts won’t work better than earlier ones. Washington thought ousting Assad would go smoothly. After 20 months of conflict, his support perhaps is stronger than ever. Syrians want no part of Western dominance. They know who’s responsible for daily violence. They want Syria kept secular. They reject fundamentalist Al Qaeda/Salafist rule. Perhaps Washington bit off more than it can chew. It’s too early to know. Regime change plans are firm. Bipartisan complicity supports it. The road to Tehran runs through Damascus. Failure to oust Assad and isolate Iran disrupts America’s Greater Middle East agenda. The fullness of time will determine if Syrians, Iraqis, Afghans, Libyans, Iranians, Palestinians, and others defeat US regional ambitions. Peace advocates hope for the best. Humanity will have just cause to exhale. All the more so if defeat becomes America’s Waterloo.